In Bristol’s year as European Green Capital, Bristol Parks Forum are pleased to be working with Bristol Parks to install recycling bins in ten of Bristol’s parks. If this pilot project is successful then we hope to roll it out to more parks in the future. Bristol Parks Forum originally applied for a Green Capital Strategic Grant for this project; our application was turned down but Bristol City Council have now found alternative funding to allow the project to go ahead. 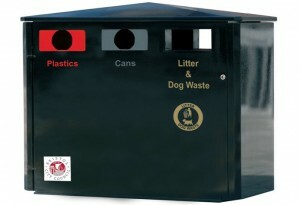 The project will involve replacing 42 existing bins with recycling bins similar to the one shown here, with sections for metal cans, plastic bottles and general waste (including dog waste). In addition 4 other existing bins will be coverted. The actual bins will have additional signage to make it clear what can be put in each section. We have a provisional list of parks and will be contacting the relevant park groups to ensure they are happy with the proposed locations before going ahead. We will not be replacing all the bins in the selected parks, it will be those that are most used. Bins that are removed and are still in a servicable condition will be used to replace damaged bins or add additional bins in other parks. Cans and plastic bottles have been targeted because they form a high percentage of the waste collected from parks. The success of the project will be based the volume of recycled material collected that is sufficiently free from contamination to be sent to recycling plants. This entry was posted in Bristol City Council, Green Capital 2015, News and tagged bins, recycling, waste. Bookmark the permalink.